Burt’s Bees Baby Getting Started Gift Set, makes a welcome baby gift for a new mom. It has everything a mama needs to gently care for her little one’s delicate skin. This 5 piece gift set comes in an attractive box making it the perfect gift for Mother’s Day or a baby shower. It includes trial sizes of Burt’s Bees Baby Nourishing Lotion, Shampoo & Wash, Cream-to-Powder, Nourishing Baby Oil and Buttermilk Soap. These baby care products are specially formulated with natural ingredients and are gentle enough to use everyday. They are pediatrician-tested and contain no phthalates, parabens, petrolatum or SLS. The convenient sizes make it easy to keep at hands reach or stash in a diaper bag. This set makes the perfect baby shower gift or a gift for a new mom. 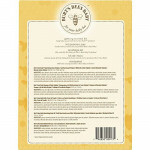 Keep baby natural with Burt’s Bees Baby products from Burt’s Bees.